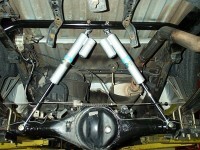 Place the shock hoop between the frame rails directly above the bumpstop drop bracket with the 3” square gussets between the hoop sides and frame. At times this may be a “press fit” and may even require a small amount of grinding to the ends of the hoop to allow fitment. 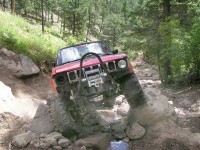 The hoop should be placed so the shocks will face the rear of the vehicle. When looking at the setup from the side of the vehicle with the rear suspension unloaded, the shocks should be angled with the bottom slightly toward the front of the vehicle, so that at ride height the shocks will be standing straight up and down. Once the paint has dried, install and fasten the proportioning valve to the frame rail. Install the proportioning valve lever bracket on the axle housing. Install the shock absorbers on the shock hoop with the provided nuts washers. Fasten the parking brake cables to the levers.